The kitchen is one of the most popular rooms in the home. 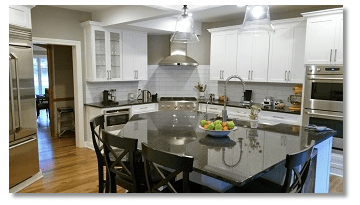 As such, kitchen remodeling projects are some of the most requested services we provide. We want to take the vision you have for your new kitchen and make it a reality. You’ll be helping make decisions along the way so that nothing is a surprise at the completion of the project. We understand that the decision to remodel your kitchen is never easy. You must take into consideration the disruption to your family life as well as the construction taking place and the potential mess left behind. Our kitchen design and remodeling professionals also take those issues into consideration. We work to maintain a clean work area and to finish the job as efficiently as possible to minimize the negative effects of a kitchen remodel. Our goal is to help design and build your kitchen the way you want. We enjoy the challenges involved in all kitchen remodeling projects regardless of scope. As professional home remodeling contractors, we believe that every homeowner should be proud of each room in their home. Our purpose is to create a kitchen that you will love and be proud of for many years. 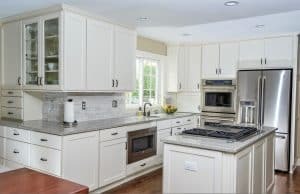 If you are looking for kitchen remodeling in Brookfield, Pewaukee, Sussex, Delafield, or Waukesha County — We’d be happy to have the opportunity to work with you! Call us today to schedule an in-home consultation on your kitchen remodel ideas.